See the Minnesota River Basin in a whole different way that harks back to a time before automobiles. 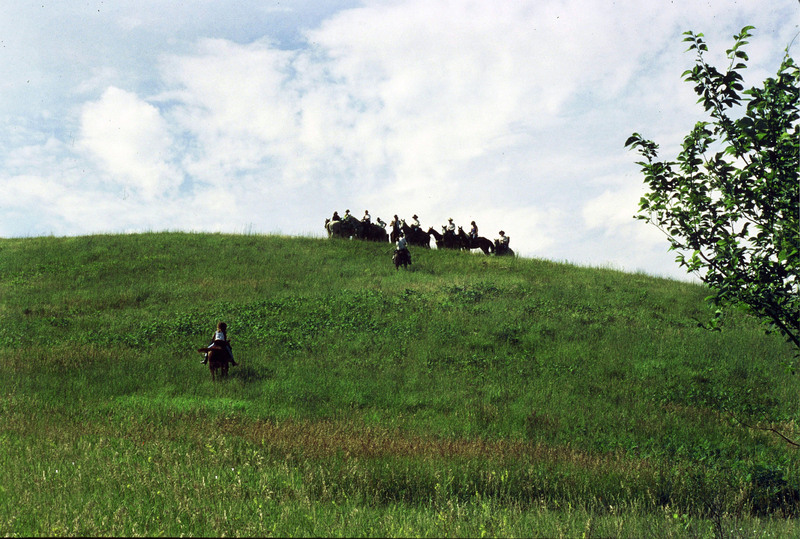 Some of the best places to ride horse can be found at Rush River Park near Henderson and the two state parks – Upper Sioux Agency (near Granite Falls) and Fort Ridgely (south of Franklin). Check out the Minnesota Valley Trail with its multi-use trail running from Shakopee to Belle Plaine. Enjoy spectacular views of the valley from the back of a horse (Photo below by Ron Bolduan). Minnesota Valley State Recreation Area - http://www.dnr.state.mn.us/state_parks/minnesota_valley/index.html Located in the Lower Minnesota River Watershed between Shakopee and Chaska, this state recreation area has 30 miles of horseback riding trails and a Horse Camp (hitching rails and four fire rings). Lac qui Parle State Park - http://www.dnr.state.mn.us/state_parks/lac_qui_parle/index.html Situated at the south end of the lake, this state park has 5 miles of flat trails in the Lower Unit. Sibley State Park - http://www.dnr.state.mn.us/state_parks/sibley/index.html North of Willmar, this state park has 7 miles of horseback riding trails starting at the Horse Trail Center. Glacial Lakes State Park - http://www.dnr.state.mn.us/state_parks/glacial_lakes/index.html On the far northwest edge of the basin, this state park has 8 horse camp sites. Camden State Park - http://www.dnr.state.mn.us/state_parks/camden/rec.html Close to Marshall, this state park has 10 miles of horseback trails and a horse campsite. Upper Sioux Agency State Park - http://www.dnr.state.mn.us/state_parks/upper_sioux_agency/index.html Located at the confluence of the Minnesota and Yellow Medicine rivers, this state park has 16 miles of trails and a horseback riding campground. For Ridgely State Park - http://www.dnr.state.mn.us/state_parks/fort_ridgely/index.html On the east side of the Minnesota River, this state park has 10 miles of trails. Rush River Park - http://www.co.sibley.mn.us/public_works/rush_river_park.html - Southwest of Henderson, this Sibley County Park is a favorite spot for horseback riders.